Let’s go back to 2008 when lead singer Dan Reynolds bumped into drummer Andrew Tolman at Brigham Young University in Utah where the locals like to claim them as their own. It was Tolman who enlisted guitarist Wayne “Wing” Sermon who in turn brought in the bass player Ben McKee. For a while back there Tolman’s wife Brittany assisted on backup vocals and keys. 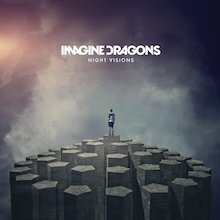 Their independent EP Imagine Dragons (2009) set the ball rolling and further EPs Hell and Silence and It’s Time were of such high quality that they were snapped up by Interscope/KIDinaKORNER. The Tolmans left by mutual consent just before the name took off but it was also pretty seamless since new drummer Daniel Platzman would fit right in. A stroke of luck came when they depped for Train at the Bite of Las Vegas Festival in 2009 and caused such a positive reaction that they were immediately packing out halls in their own right and the big deal landed in November 2011. Aware of the trend for diversification Imagine Dragons enlisted Alex da Kid, the English born producer from North London whose track record with Nicky Minaj, Massive Attack, Rihanna, Dr. Dre and Eminem has made him such a got property. His presence at the controls ever since is a crucial part of the sound and another reason why Imagine Dragons can flay a rock crowd and delight a club audience equally. Smart move. The first fruits were the Continued Silence EP whose six tracks include “Radioactive” a slow burner that would spend over eighteen months on the Billboard Hot 100, receive lavish critical acclaim and win the Grammy for Best Rock performance, 2014. Based on a template of guitar rock with elements of electro and dubstep this song announced the arrival of a major new talent. If that was good then so was the rest: “It’s Time” went Top 20 and created the buzz in Europe. The logical debut album Night Visions gathers together the EP highlights like the radio smash “Amsterdam” and the re-mastered and re-recorded “Hear Me”, another big draw for an ever-curious UK crowd. Many people’s favourite is the lengthy, synth and chopped up rock riffed “Bleeding Out”, one of the most inspired productions of recent times. A heady tale of sacrifice and bloodletting this song makes an immediate link between the group and the fans. To get the complete package check out the iTunes, Spotify, Best Buy, Target and North American deluxe edition where further unreleased material and older EP cuts like “Round and Round” offer a rounded picture of their work to that time. The Night Visions experience was enhanced by a celebrated tour of North America and Europe, including a trip to the Isle of Wight for Vevo’s Summer Six series. 2013’s Live at Independent Records (from Denver, Colorado) is a short, sharp blitz that accompanied the contemporary Record Store Day event and is much sought after. A more substantial account of Imagine Dragons live prowess is the Night Visions Live performance from Red Rocks Amphitheatre in Denver: again this is available in a variety of formats with insights into their working process with Alexander Grant (da Kid), extended performances and videos. So we move to the present. Smoke + Mirrors debuted at number one in the US and the UK and the Canadian Albums Chart. Spawning huge hits in “I Bet My Life”, “Gold” and the most recent “Shots” the second release had immediate impact on those who also loved Foster the People and Mumford & Sons, acts the band have cited and praised for bringing interesting alternative sounds back to the mainstream. Having recorded the first album in Los Angeles, Imagine Dragons retreated to the comport of their home studios to create Smoke + Mirrors, coming up with something grand enough to fill a stadium and intimate enough to connect on a one to one level. The standout “Gold”, which resembles a Spaghetti Western meets Sci Fi soundtrack, is an obvious earworm but so are the moody “Hopeless Opus”, “Trouble” and the lengthy closer ”The Fall”. Reynolds’ lyrics are becoming ever more personal and the band playing gets better and better with every spin. This is available in Deluxe, International deluxe, Super deluxe and Physical Super Deluxe (the latter including pieces that appear on Sports soundtracks, Transformers: Age of Extinction, Infinity Blade 111 Game and the massive The Hunger Games: Catching Fire). Covering many bases, in a modern idiom, Imagine Dragons are currently on tour, visiting South America, the Americas, Asia, Oceania and Europe and will be on the road until February 2016. Whew! So no excuses not to catch them by the tail. Here be dragons: Imagine Dragons. Great name, great band. Historically, there's a progression that bands usually follow before their sound goes full-on arena rock. Things will start small and gritty, and then as the fame and crowds build, the sound changes to match the massiveness of the venues. However, on their debut album, Imagine Dragons buck tradition and swing straight for the cheap seats, doing away with generations of sonic evolution in favor of the huge, arena-made sound of Night Visions. Dramatic and sweeping, the Las Vegas band works in the same vein as pop giants Coldplay, offering up track after track of hooky and emotional midtempo jams. While a move like this might seem overly ambitious for a freshman band, Imagine Dragons are able to pull the sound off, with songs like the already ubiquitous, seemingly soundtrack-ready "It's Time" having no trouble worming their way into whatever part of the brain it is that likes to trap songs against listeners' will. The problem is, while the band's electronically reinforced sound is definitely big, it sometimes feels as though it lacks depth. Despite this, "Every Night" will certainly have some listeners unconsciously reaching for a lighter to wave in the air before they realize what they're doing, and it's exactly these kinds of surface pleasures that we turn to pop music for in the first place. What this means is that even though Imagine Dragons might have skipped a few steps along the way to their arena sound, Night Visions is still an album that, at least for a few minutes at a time, will make everyday life seem just a little bit bigger. Conspicuously absent from the laundry list of influences the Imagine Dragons so often cite is the Killers, the only other Las Vegas rock band of note. Imagine Dragons downplay the glamour the Killers found so alluring but they share a taste for the overblown, something that comes to full fruition on their second album, Smoke + Mirrors. 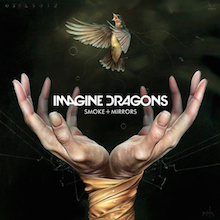 Bigger and bolder than 2012's Night Visions, Smoke + Mirrors captures a band so intoxicated with their sudden surprise success that they've decided to indulge in every excess. They ratchet up their signature stomp -- it's there on "I Bet My Life," the first single and a song that's meant to reassure fans that they're not going to get something different the second time around -- but they've also wisely decided to broaden their horizons, seizing the possibilities offered by fellow arena rockers Coldplay and Black Keys. Despite the bloozy bluster of "I'm So Sorry" -- a Black Keys number stripped of any sense of R&B groove -- the group usually favors the sky-scraping sentiment of Coldplay, but where Chris Martin's crew often seems pious, there's a genial bros-next-door quality to Imagine Dragons that deflates their grandiosity. Certainly, Smoke + Mirrors is rock so large it's cavernous -- the reverb nearly functions as a fifth instrument in the band -- but the group's straight-faced commitment to the patently ridiculous has its charm, particularly because they possess no sense of pretension. This separates ID from the Killers, who never met a big idea they didn't like. Imagine Dragons like big sounds and big emotions -- and, if they can muster it, big hooks -- and the commitment to style over substance gives them ingratiating charm, particularly when they decide to thread in slight elements of EDM on "Shots" (something that surfaces on the title track as well), or Vampire Weekend's worldbeat flirtations on "Summer." Imagine Dragons purposefully cobble their sound together from these heavy-hitters of alt-rock, straightening them into something easily digestible for the masses but, like so many commercially minded combos, how they assemble these familiar pieces often results in pleasingly odd combinations. These guys are shameless and that's what makes them more fun than your average arena rockers.